It’s the end of a day that never happened at the AIC. By this time I would have been back home after two trains and a bus ride back from the Loop. I never minded the one-hour-and-fifteen-minute-each-way commute, or the 6:25am wake up call. This in itself was significant; it meant I was truly doing something that I loved, enough to override the chronic grogginess that plague my mornings. Week 8 was a busy week: Tuesday was an adult highlights tour with Hana, Wednesday was a Chagall talk on the America Windows with April, and Thursday was a tour for students who were visually impaired, with Hana, April, Allie, Felicia and Alessandra. We also had a chance to meet the donors of our internship program. It was incredibly rewarding to meet them and talk to them about what we accomplished in the last eight weeks. Being able to reflect on all the work we did together as a group, to the family that made it all possible, was the best way for us to come to terms with the fact that it was all ending very soon. I participated in an unusual adult tour in my last week, a 30-minute talk on a single piece of art rather than a tour of three or more objects. I thoroughly enjoyed this tour format, especially with an object like the America Windows where there was so much to look at in a location that felt contained and cozy. I really enjoyed collaborating with April because we could support each other with our different strengths. She was very good at remembering facts and the chronology of things, while I felt more comfortable facilitating discussions about mood and symbolism. Working in a collaborative partnership (from lesson planning to execution) was extremely rewarding for me, when I found myself thinking significantly more efficiently and creatively than when I was working alone. 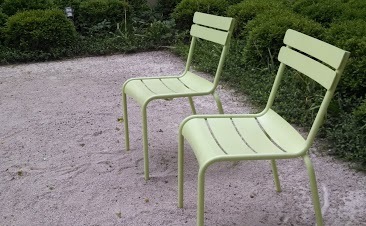 From this experience I think I have learned that, similar to classroom teaching, I would much rather co-teach an art object on a tour than try to lead a whole discussion alone. My final tour of the internship was with a group of students who were visually impaired, and I could not have asked for a more rewarding ending to my experience at AIC! Researching for this tour was a great way to analyze the structure of the museum from a new perspective. I found out that there was a lot of current research going on in making museums more accessible for individuals with diverse abilities. In my time here at the museum, I must admit I constantly saw art being touched. Being an art maker and handler of my own artwork, half of the pleasure is in the tactile sensation of the materials, existing without barriers of a frame, glass or velvet rope. This tour made me think more about this paradox; how art comes into existence through the hand, but is then deprived of the human touch once it becomes a finished piece. It all seemed so silly to me the more I thought about it. We took four students on our tour, three had varying degrees of partial sight and one student was completely blind. 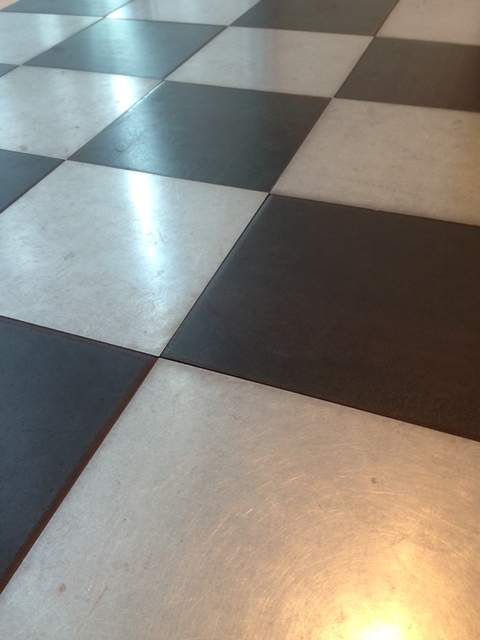 My favorite conversation came at Carl Andre’s Steel Zinc Plain. The student who was completely blind stepped on the platform first and spent some time walking around the tiled surface and touching the edges of the platform with her white cane to decipher its shape. It was obvious how much she was enjoying this process, having the artwork all to herself to step, turn and tap in order to better see it. Afterward, we had all students get down on the floor and touch the tiles to distinguish the different materials they were made of. They connected the alternating pattern to that of a old kitchen floor, and also made note of the temperature of the tiles. I ended the conversation by asking them if they felt differently about a type of artwork that allowed viewers to walk over it. 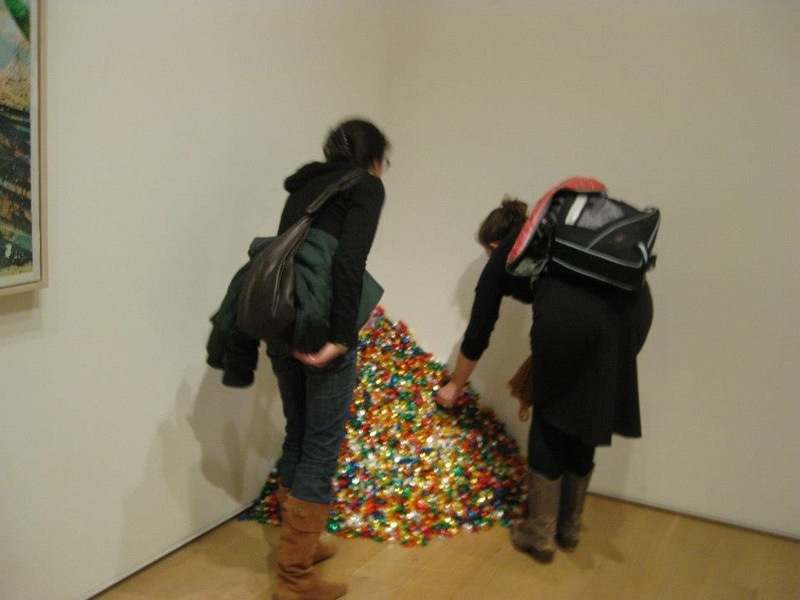 Did the artwork gain or loose any value or significance by being on the floor? I expected them to reflect on how a piece might be less valued if left on the floor and how walking on someone else’s work could seem a bit disrespectful. However, the student I mentioned above surprised me with her perspective. She appreciated having a work of art leave the walls and enter her space, how it allowed her to approach it and discover it through her normal process of touch and tapping. 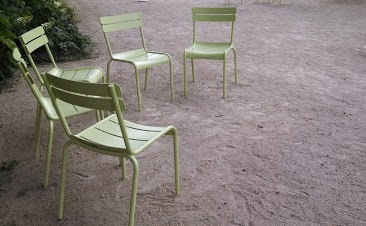 Listening to her talk made me realize how completely isolating it must feel to be without sight in a visual art museum. 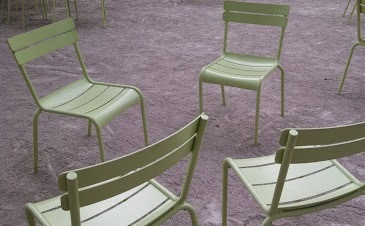 I imagined a parallel situation of feeling lonely in a room full of people; it is hard to appreciate the company when you cannot connect with others. I believe the artwork wants to connect with all viewers, regardless of the visual abilities of its audience, and that touch only seems the most direct way to do so. Being so fresh out of this experience, it is hard for me to conceptualize the big picture of how this internship impacted me as an artist/educator. One thing I can say for sure is that this internship completely changed the way I saw the medium I thought I was most familiar with. Before this experience, I looked at art only for what I could get out of it in terms of technique. Now, I see conversations between artists and movements, technique and history, spontaneity and process. Art is much more alive to me now than simply objects moving along a conveyer belt of white walls. 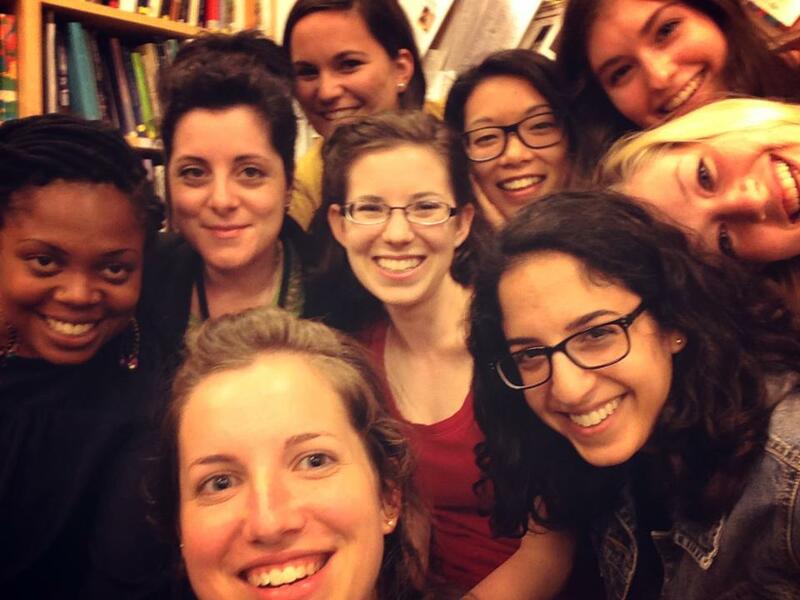 I have all my peer interns to thank, for passing on their knowledge and diverse interests in art conversations with me. I have the mentors to thank, for supporting me in my insecurities and training me on how to share the looking process with you, the viewer. Thank you ALL for lending you eyes, ears and most importantly, your thoughts. 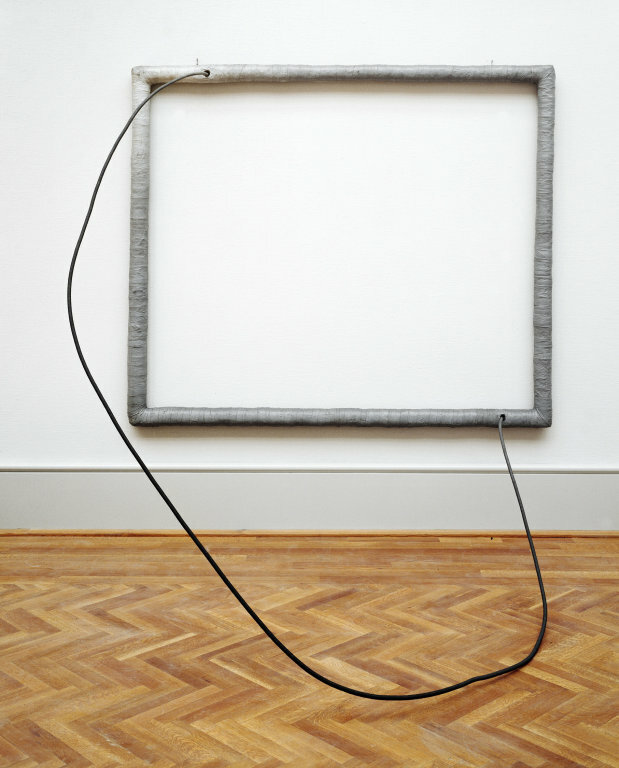 Eva Hesse and I both have German last names. The love affair begins. She had this incredible life that I cannot connect with necessarily, but her response to her life through the artistic process is something I could understand. Every stage of her inner and outer life had a parallel visual reference in sculptural form. She traced her life through her hands and imprinted it into visual realm and material substance. 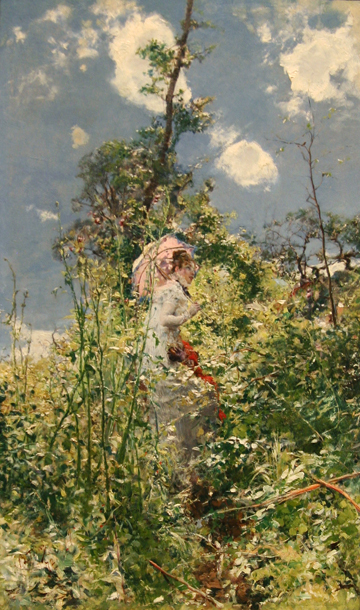 It seems as though Hesse was always going through various stages of metamorphosis and that she was always shedding leftover skin, which resulted in these artworks. Similarly, I can related to the need to take in life events but release my reaction in material form. I think there is a divide in the art education I had in college between process-based art making and conceptually driven art making. I constantly felt that I needed to work with a conceptual end goal in mind, while I fell under the process-based practice or working. Her process was her therapy and it is the same for me, whether or not an idea is fully formulated. As soon as an artist touches the material, the human exists in the form, that to me is enough of an idea. I never liked this piece because I never understood the hype. It was always strange and at time uncomfortable to look at. After researching more about Grant Wood, I came to know this piece from a more familiar subject matter or childhood memory and nostalgia. I loved that Wood came back home, to his childhood landscape and community. I loved that he found so much to discover in the most familiar places and I respected him for that. He also dealt with nostalgia for a place that no longer existed (whether it be the small towns or small town folks). This is the most meaningful subject matter for me; the ephemeral moments in time and place that I try to relive through the process of recreating them in my artwork. I never really liked Chagall, but I also never knew he worked in other media aside from oil paint. I encountered the America Windows that he made specifically for AIC and was intrigued by how much alike they were to his paintings, yet how unlike the windows were in the imprint it made in the space it encountered. Chagall paintings, though at times colorful and always whimsical, always felt ephemeral and a bit too salty for my taste. Salty was definitely a good word to describe what I saw in his paintings, either salty mushroom soup, flavored popcorn, or chips. They were potent and sucked all the moisture from its surrounding space. However, after encountering the stained glass America Windows, I felt that Chagall should have made all of his paintings in the medium of stained glass. His paintings lack the illumination of natural light that was at the core of all the subject-matter he painted. I have learned to love Chagall through these windows, which I studied so closely for student and adult tours. I learned about my connection to Chagall’s life and childhood. Like Grant Wood, I could relate to Chagall’s desire to reminisce over a lost moment in time, of home and comfort. Sometime in the first or second week of training, we had to do a practice lesson plan on a pretend student/adult tour. 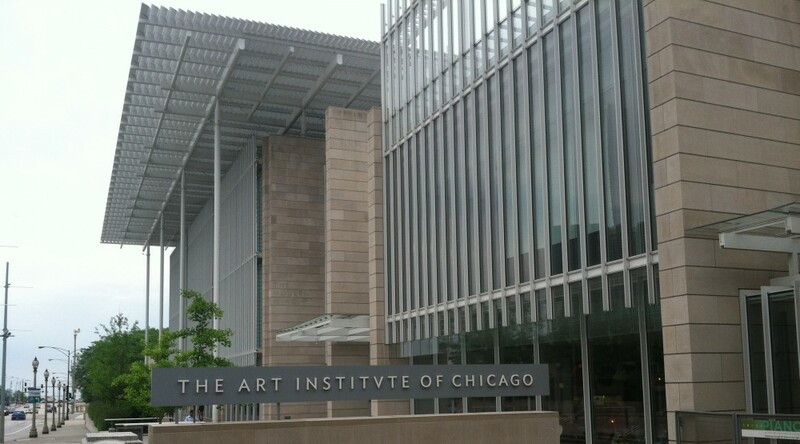 Having had trouble with my internet at home and obtaining the list of Highlights of the Art Institute, I made a random choice on-the-spot to do The Beggar for my tour. Later I found it in the gallery (222) and was a bit irritated at myself for not having planned enough ahead to pick a more exciting looking piece. Over time, I became more and more familiar with the subject and began to really love this piece for all of its subtle glory. Manet put a personal face to the old, meandering Parisian streets and alleyways that were being torn down to be replaced with fresher, cleaner and more sterile urban plans. 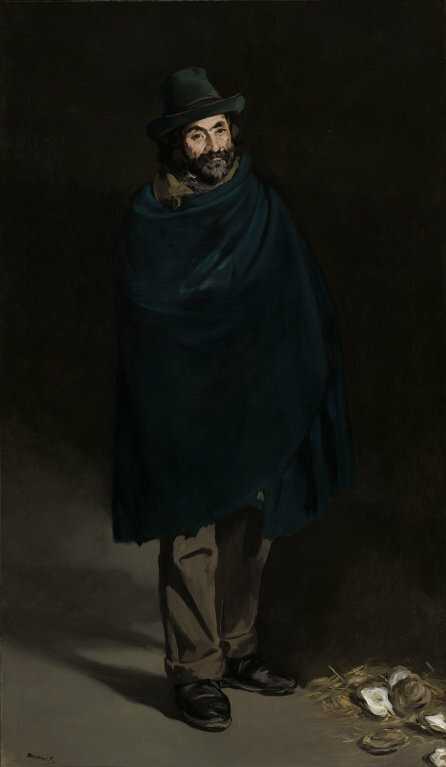 Manet believed the beggars knew all the secrets of life, having lived in the city the longest and observed the world through the sidelines of everyday life. The beggar was naturally a philosopher, who possessed knowledge that no one else could have without being in such a position. After learning about this, I felt Manet could have fit perfectly in the contemporary art world, having such substance in his work that I never thought existed during the time period surrounding Impressionism (before and after). It always takes me 6 weeks to get used to a new environment; week 6 at AIC was the most fluid week of the internship. I had two student tours, one adult tour and one family tour, all which went very smoothly. Children tours are great for many reasons. For one, kids (1st-4th grade) are SUPER ENTHUSIASTIC when they enter the museum, in particular the bathroom of the Ryan Education Center! Something about that bathroom really gets them excited about the rest of the museum space. For another, their responses are always surprising, whether it’s simply the “ohhhhhh that’s huge” to Warhol’s Mao or their answers to certain questions. 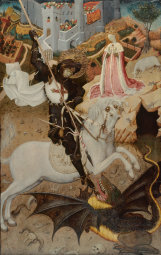 One good example came on Friday when I asked children on the family tour to consider who they would want to be in the painting of Bernat Martorell’s Saint George Killing the Dragon, and one boy said, “I want to be the bones,” very definitively, while the 3-4 year old girl said she would be the knight with the spear. Peculiar and delightful. I really enjoy when other people adopt our student tours and offer their opinions about the artwork. Sometimes officers will come by and tell us their thoughts about a piece, which I find to be the most thoughtful considering they have the most time in front of a piece. Other times, regular visitors will stop in and add comments and I really enjoy their company too. I think this gives students great exposure to dialogue and critique. As a student, I learned most from critiques in art classes, where I was exposed to debate through looking and finding evidence in the work. I learned through the modeling done by my art teacher and older peers, somewhat parallel to how some of these anonymous individuals from outside the tour come in and model their feedback. I think this is a great example of how art works, drawing in people from different backgrounds but with a common interest in a piece, who break down their interpretation from their experiences and educate us on their background simultaneously. I call this the language of art, it isn’t a single language (i.e. English, French) it is simply an interpretive dialogue. I love adult tours for other reasons than student tours. With adults, you have the ability to spend more time with a piece, and digest the work on many different levels. Through my Romanticism and Romantics express talk, I also finally learned about the period of Romanticism as well as found a new favorite portrait artists Giovanni Boldini. In the process of preparing for an adult talk about Chagall’s American Windows, we were told that audience members like to reference a goat that can be found in many Chagall paintings and that it is a metaphor for the artist. Both my touring partner April and I had no idea clue about this goat reference but both simultaneously wrote down, “know the goat,” on our notepads. Thus, we decided that when planning for adult tours, the thing to keep in mind is to “know the goat,” as best as you can. I like this phrase. I will leave you with a new-found love that I discovered in the last half hour of perusing around the museum. 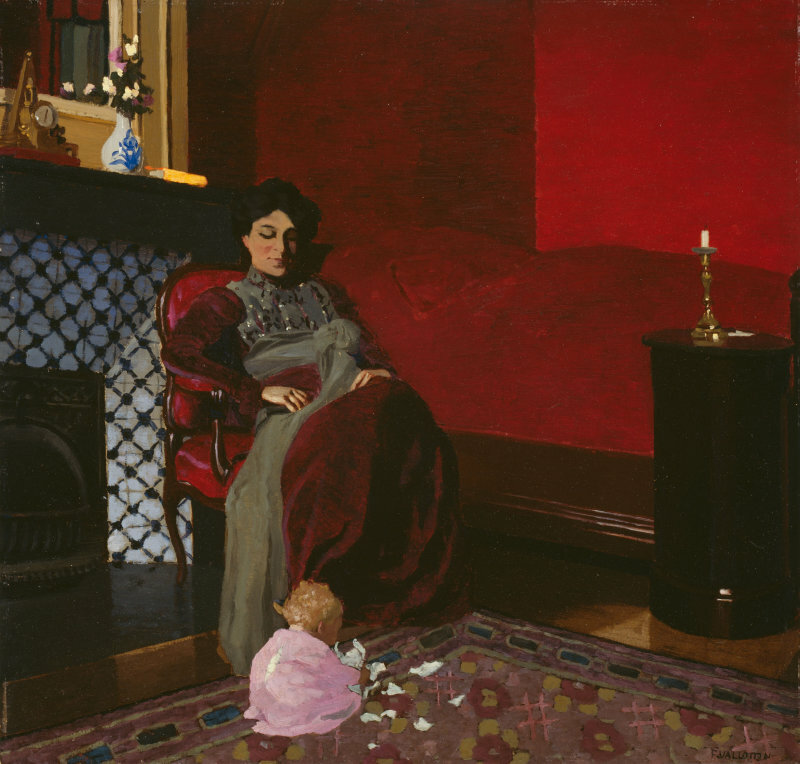 This is a piece by Felix-Edouard Vallotton, oil on panel, called Madame Vallotton and Her Niece, Germaine Aghion, that is exquisite in the way it just glows on the dark panel. The patterns and shadows are blocked in such a contemporary graphic way, although this piece was made in 1899. I will also leave you with three shots of a quiet gallery before opening hours. 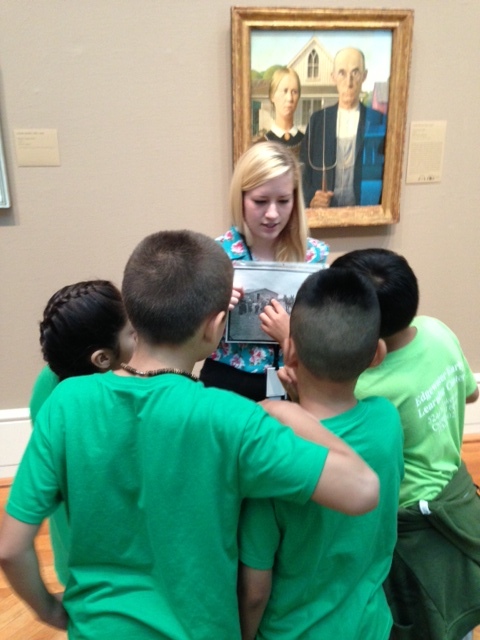 These moments might be the part I miss most about working in a museum setting. Having a gallery to oneself before any officers or visitors is a glorious experience and makes me feel very, very special. Half of this week was spent at the Millennium Park Family Fun tent, and the other half was spent obsessing over my friend Felix… as in Felix Gonzalez-Torres. My favorite piece in the Art Institute of Chicago is definitely “Untitled” (Portrait of Ross in L.A.) by Felix (no disrespect in using first names here, it is simply harder to say “Gonzalez-Torres”). I cannot remember my first encounter with this piece, but it must have been in high school when my incredibly life-changing art teacher Mz. 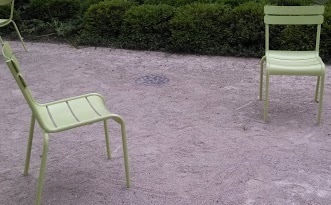 Real introduced me to Conceptual Art. When I first started training I became very aware of my “viewing experience” when we were asked to write about “our looking process.” Along with this assignment, I was starting to pay closer attention in conversations with my peer interns about their viewing experience and considered how they differed from my own. I was amazed to realize that most of them had a personal, emotional connection to artworks; this sounds silly but true. In my mind, I could never understand why people who didn’t make art found art to be interesting or emotionally stimulating. What was worse, I never really had an emotionally stimulating response to artwork growing up. The only memory I have of responding in any sort of emotional way to artwork was at a Toulouse-Lautrec special exhibition at AIC and a single Francis Bacon painting at MIlwaukee Art Museum in my high school art class field trips. However, I specifically remember the Toulouse-Lautrec impacting me in terms of technique and finding his approach to the figure in his simple sketches on brown paper to be wonderfully elegant. I wanted to draw and paint like Toulouse-Lautrec. Again, not so much emotional as technical. The Francis Bacon piece might have stood out in my memory simply because of how horrifying it was to look at, as well as funny at the same time. Even in college, the only love I really ever had for art were works that tricked me technically. When I flipped through an Ed Ruscha book and found his soft silhouetted blue painting of a boat, it was love at first sight. However, I had never seen it in person, and half the fascination was with his smokey, “strokeless painting” technique. To make a long story short, my art-making practice had pretty much robbed me of an experience that everyone else in the world at AIC seemed to be having with artwork, which is some kind of emotional response and attachment to a piece of work. I revisited the Portrait of Ross in L.A. about half a year ago before this internship, with some friends from out of town, and surprisingly, I remembered what it was about (not having remembered the last time I saw it). This time around, I paid more attention to it and even though I had to move on with my friends, I thought about it afterwards. Ross simply lingered there in limbo waiting to be rediscovered in all his colorful, shiny, warm glow. When I came back to AIC, expected to do research and spend time with an art piece, you can image my first stop was with Felix & Ross. The more time I gave this piece, the more I loved it for all of its sadness and contradictions that I could not mend. As a viewer, I had a chicken-egg problem to solve: taking a piece of Ross was part of my duty, but half of me wanted to keep him a whole 175 pounds. 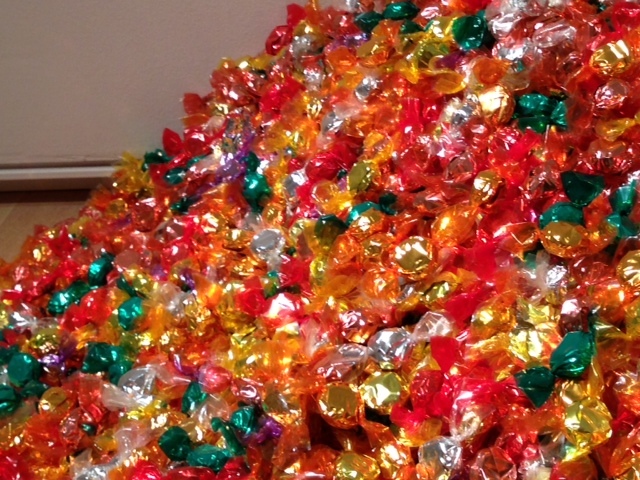 I always ended up taking a piece of candy anyway, sometimes I ate it right away (outside of the gallery folks!) and sometimes I kept it as a companion for the rest of the day until I left work. Every time I stood before Ross, I always felt like I was at his grave, but instead of a tombstone his was a pile of candy. 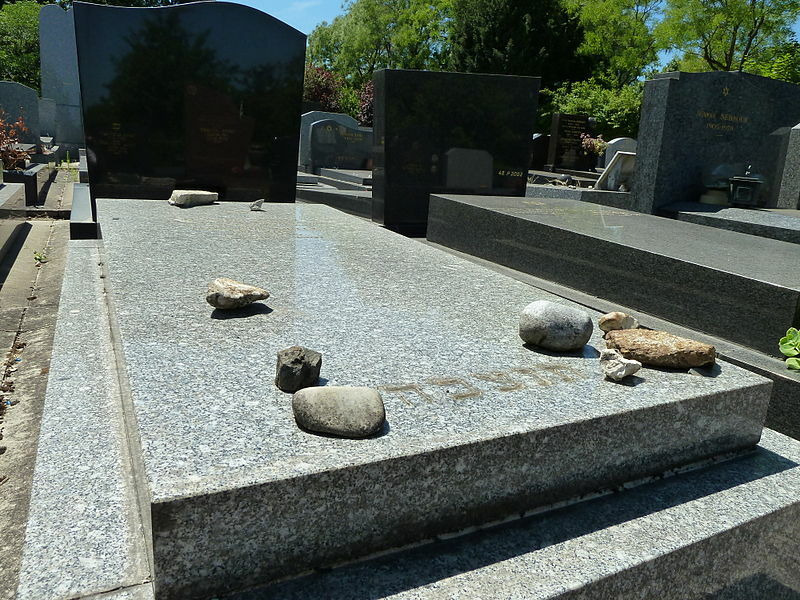 In traditional Jewish gravesite, it is a custom to leave a rock on someone’s tombstone to show your remembrance of the individual (see photo on right). 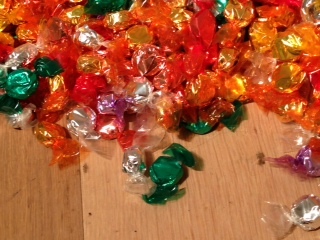 Thus, these candies made a strange connection to that custom being a pile of many stone-like objects, while it fulfilled the exact opposite goal of asking people to take away a symbol of remembrance. This was another contradiction that boggled me and kept me chasing my tail every time I returned. I could go on and on about why I love this piece so much. But I will end with saying that this piece was also so wonderful because it finally gave Conceptual Art a heart and depth for people to connect to. I think Felix was one of the only artists who truly made Conceptual Art accessible to those who otherwise hated the genre. The greatest joy in my experience with being a Museum Educator so far has been seeing people’s reactions before and after learning about the concept behind Portrait of Ross in L.A. 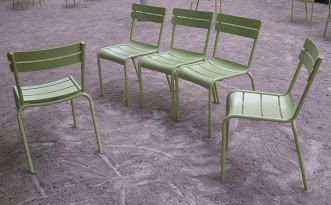 I had the honor of leading two discussion on this piece, one with adults and one with a group of young girl refugees. Both audiences were incredibly thoughtful and sincere about how they felt they understood Felix’s sadness and love for Ross. It was easy to talk about both from a conceptual perspective and a visual one too (with one lady coming up to me afterward reiterating how she really got the idea that “less really is more! Look at how it is so much AND more when it is so simple just like their love for each other…”). Yes, it is true. Week 4 was a bit hectic being the week of 4th of July and the week before Taste of Chicago. 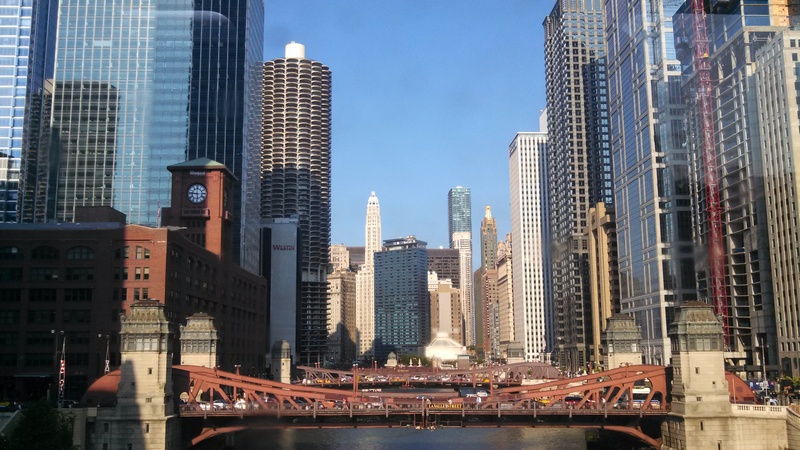 One must remember that when working in downtown Chicago in the summer, street festivals and sports teams will always get in the way of daily business. So, be a palm tree and go with the flow. One problem I am having with this internship is that EVERYTHING IS INTERESTING, which is a distraction when you have limited time and are doing research for a particular piece and tour. 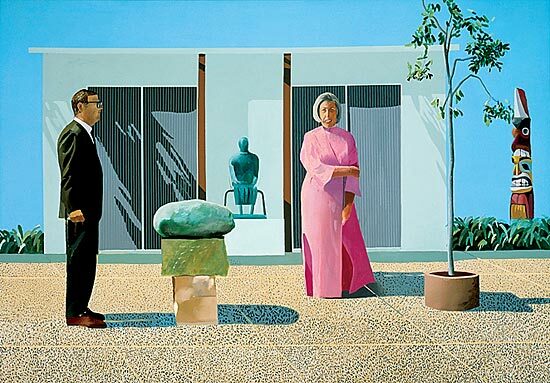 I started researching David Hockney for a tour on the Highlights of the Modern Wing. 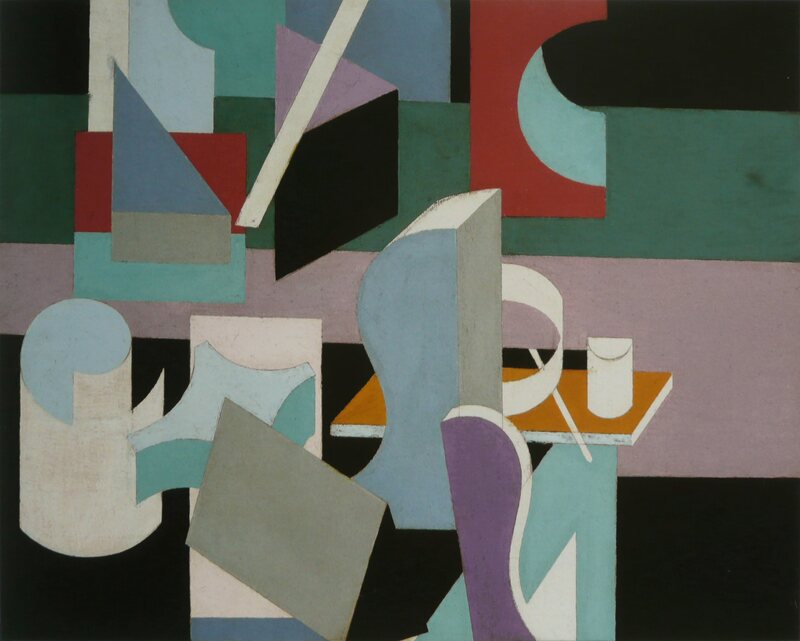 The piece I was supposed to focus on was American Collectors (Fred and Marcia Weisman), which is a piece I adore. 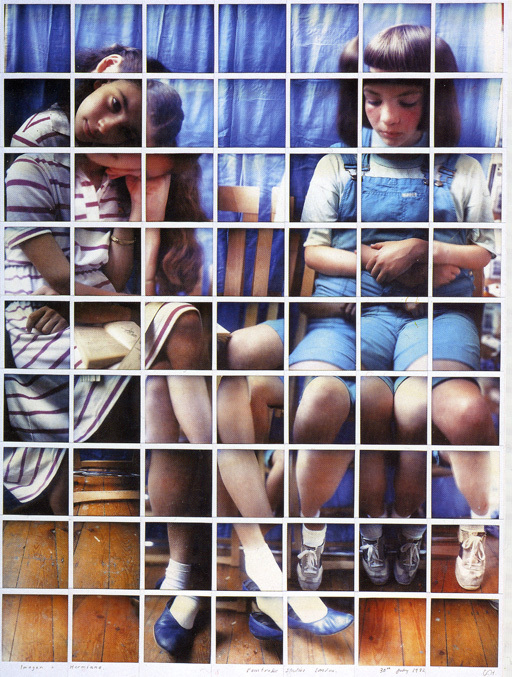 However, as soon as I discovered Hockney’s other works with photography and polaroids, I went off on a research tangent for at least an hour, if not more. This is a common occurrence. Every highway of research has led me to a side street or alleyway experience about a small detail that I found interesting. Many times it is an interview or another body of work referenced to explain something about the piece I am researching. Sometimes it’s something so simple as an interesting book title sitting next to the book I need on a bookshelf or a misspelled search that leads me to unexpected results. We visited the Restoration department and saw paintings at different stages of restoration. It was a fascinating visit to see artworks up close just sitting on a shelf or an easel a few inches away from me. I was most intrigued by the idea of the conservator who has to go in and touch up the paintings. I see the conservator as a ghost who has to go in and recreate what used to be in the missing tooth of information but without being seen. Hello readers! My name is Maya and I am from Chicago (okay… Skokie). I recently completed my BFA’s in both Painting and Art Education, with an endorsement in English as a Second Language at the University of Illinois at Urbana-Champaign. I am about to start my MFA in Painting at the New York Academy of Art in the fall, focusing on my interests in figurative painting and portraiture. My background is primarily in classroom Art Education, having student taught, substitute taught, and assistant taught with all K-12 grades these past 3-4 years. This week was an exciting one, both inside and outside the museum. Obviously, the Hawks won the championship (the Bulls will be next year), and we began touring with students at the museum. We also had two seminars with the President Douglas Druick and deputy director of education Judith Kirshner. Lastly, the new exhibition Impressionism, Fashion and Modernity opened this week and we able to see a sneak preview of the show before it opened up to the public. I cannot emphasize enough how much working at this museum seems completely unreal to me. I am almost halfway through and I am still in a state of disbelief. I am starting to think this “dream” state will never go away. The amount of information I am taking in, both from a museum studies perspective and my visual vocabulary is more than I can comprehend. I fear that I will only be able to grasp the magnitude of this internship only after it passes. I began studying Abelardo Morell (Cuban-American photographer) for a middle school tour about Home.This man is incredible, simply a genius. I was inspired by the fact that Morell was able to continue working even after having kids. That fact that his two lives (father and artist) could co-exist, and what more, that fatherhood could enrich his practice was the most encouraging piece of research I read about. I also love learning about the lives of immigrant artists and the filtering of art through the lens of an artist’s home culture and family background. I am also a first generation immigrant who finds the contrast between my home culture and American culture to be a constant source of inspiration as well as confusion both in daily life and in my artwork. 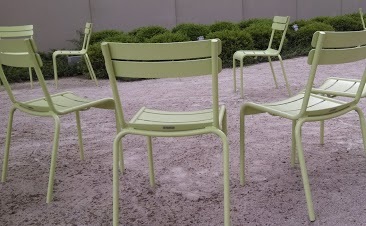 After researching Morell for a few hours, I became inspired and started shooting a series of photographs of the empty chairs surrounding me in the courtyard of the Modern Wing. 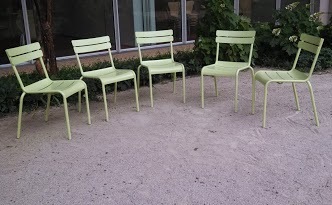 I looked at the way the chairs were left by the previous occupants and considered the narrative they might have left behind. 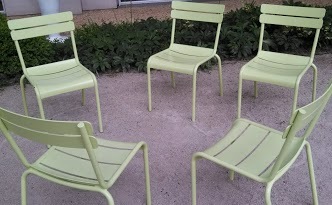 One arrangement looked like a council meeting, while another looked like an interrogation. 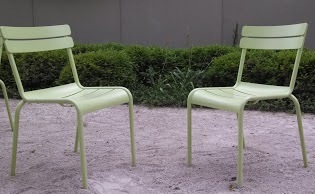 Two chairs facing the same direction next to each other looked like a pleasant conversation between a couple, while two chairs facing one another but apart a few feet looked more like an argument. I wonder if the same interpretation comes through for you? I researched the famous Chagall windows (American Windows) in the far east end of the museum and learned a lot about Chagall’s relationship with Chicago. I am not very interested in Chagall’s paintings but now I realize it is because they all feel like they are trapped in mud compared to the stained glass. In the window, Chagall’s art feels alive because the light that shines from behind the colors gives a sense of life and breath to the work. At around 4:30pm of every day, I have developed a routine of perusing around the museums for fresh air, good shots for this blog, or to look at new artwork for tour ideas. This week I found myself in the American Art galleries looking at one painting that I found really distasteful (but in a good way), next to another painting that I really adored. 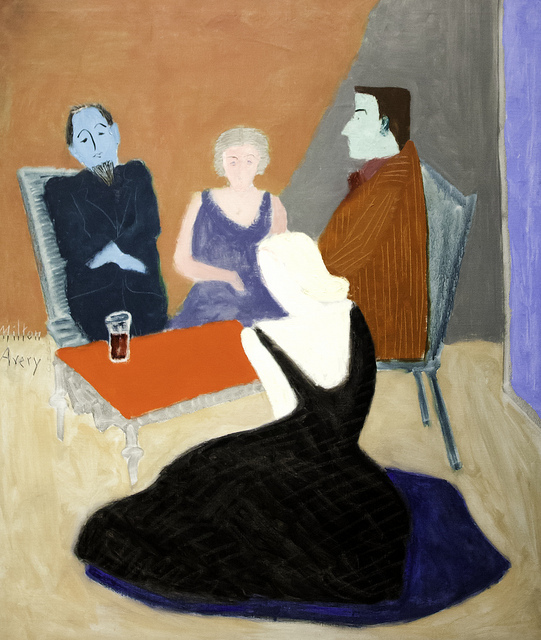 Next to this painting was this lovely piece by Milton Avery titled Conversations in the Studio. Firstly, I love the blocking of colors used to identify the individuals. This is a technique I’ve attempted to do in my past portraits. I also loved that the subject matter was a scene with his art buddies. Almost all of my paintings are about my peers, moments in time with friends and exchanges between friends. This is the most interesting subject in my opinion. Coming from an Art Education and Studio (painting) background, I was really interested in developing my knowledge of art history and criticism through research and observation of the artwork live and up-close. Knowing that a large portion of this internship focused on guiding tours and discussions about artwork, I knew that this internship would also help me overcome my discomfort with public speaking and be better able to facilitate meaningful conversation about the complex world of art. I am surprised at how the last two weeks have already made me more comfortable with the act of speaking up in a room of anonymous visitors and passerby as I practice conducting a lesson with my peer interns and Museum Education mentors. It truly makes a difference when you are surrounded by such supportive individuals who are so dedicated to your success and open to addressing your concerns with you. I love this panoramic feature on my camera; anticipate a series of action shots with fellow interns to come. I think what surprised me most about the last two weeks of docent training was the emphasis placed on the audience’s visual experience and personal interpretation and appreciation of the artwork we look at on tours. Originally, I assumed that museum tours were focused on understanding the artist’s intention and purpose for creating the specific work. I really enjoy this alternative, viewer-centered way of facilitating conversation, and I feel this approach has permanently changed the way I view artwork as an audience member. Before this internship, my experience with artwork was cold and business-like, consisting of targeting artists who were either talking about similar subject-matter that I was thinking about, or demonstrating a technical skill that I found challenging. 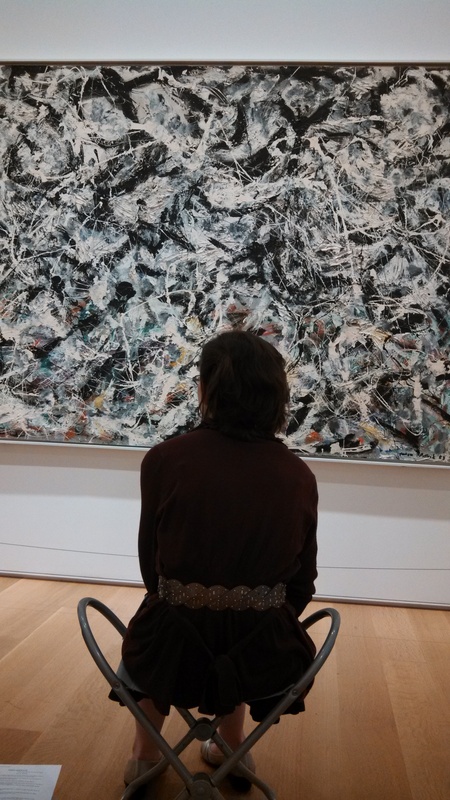 I only interpreted viewing artwork as a way to communicate with a fellow artist, which meant my approach to looking at artwork was very artist-centered and dependent on understanding the artist’s intent. I completely missed out on a whole other way of experiencing artwork, especially appreciating works that were unrelated to my practice. I felt that every new day of training helped me flex my visual and conceptual muscles more as a painter by addressing artwork I would not normally think about. Through the process of looking and giving feedback to other interns on our mock tours, I found myself reaching a few “a-ha” moments about my own work and why I am pursuing certain subjects of interest. View of the ride home. 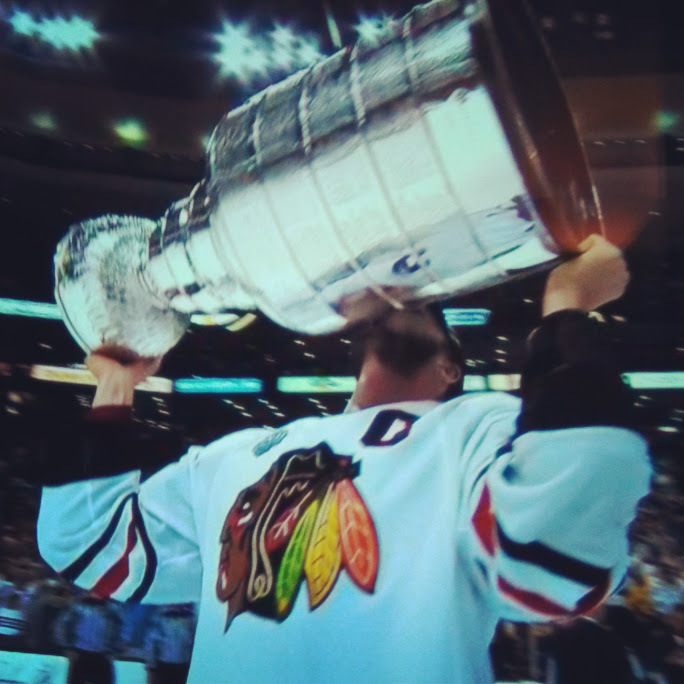 This never gets old. I was surprised to find that Museum Education and Art Education had so much in common, mainly in the format of constructing lesson plans and objectives to guide discussions. In my two weeks of developing lesson plans more specifically for the museum setting versus the studio, I came to the realization that looking at art could be just as transformative as the practice of making art in a studio.